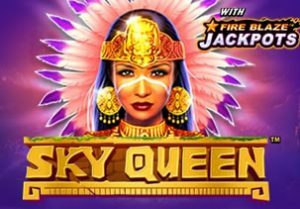 A lost jungle civilisation is the setting for Sky Queen, a 5 reel, 50 payline slot game from Playtech. This colourfully designed game comes with expanding wilds, streak re-spins where you could win 1 of 4 jackpots plus a bonus round that awards up to 16 free spins. Play on your tablet, desktop or mobile from between 25p and £500 per spin. There’s a primitive feel to the design here - jungle pyramids shrouded in mist form the backdrop to the reels. Joining the A to 10 symbols are a bowl, a carved animal head totem and green burial mask. These all pay up to 2 times your stake per payline. The best standard symbol is the leopard. Land 5 of these in combination and you’ll win a payout of 3 times your stake. The Sky Queen of the title is the wild. She can land on reels 2, 3, 4 and 5 only in the base game. Whenever the Sky Queen lands, it expands to turn the whole of the reel wild. Sky Queen comes with a pair of feature rounds. Fire Blaze Respin feature - look out for the sun symbol. Land 6 or more of these on the same spin to trigger the respin round. The sun symbols are locked in position and 3 respins are awarded. If a new sun symbol hits, it joins the original cluster and the respins resets to 3. You’ll notice that all the sun symbols come with a cash value or a star attached. This cash amounts can be anything from 1 right up to 50 times your stake. When all your respins are done, all the cash values are added together and that’s what you’ll win. Fill all of the reels with stars and you’ll win the Grand Jackpot which awards 2,000 times your stake. Suns with stars can award the Mini, Minor or Major Jackpots which pay 20, 100 or 500 times your stake respectively. Free Games feature - this round is triggered by landing 3, 4 or 5 of the pyramid scatter on the same spin. After a payout of 1, 10 or 50 times your total stake, you’ll be awarded 8 free spins. The expanding wild can land on all 5 reels during this round. You can also land the Fire Blaze Respins feature from the free spins round. Re-triggers are possible too. We liked Sky Queen. There’s a retro feel to the design here that probably wouldn’t work with other themes but is perfectly appropriate here. The streak respin is one of our favourite features and the one on offer here is a good one thanks to the extra jackpot elements. The free spins round is solid enough too. Playtech has created an impressive all-rounder here and we’re happy enough to recommend an audience with the Sky Queen. Saying that, Playtech has produced much better slot games which offer more when it comes to bonus features – you cannot go wrong with Age of the Gods or Justice League in my opinion.